To date, approximately 20 percent of the garage expansion is complete. The precast erection crews have been able to pick up speed and set one section in less than a week. We are anticipating the South half of the garage to be set in full before Christmas. As previously stated, a steady stream of very large tractor trailer trucks will continue making deliveries to the site until early-February of next year. Concrete foundation crews are demobilizing until the precast erection crane can be moved out of the building’s footprint, which should happen in early February. After that, crews will return to complete the footing for the stair tower the wall along the east side of the garage. The recent rain delayed the backfill and rock operations in the northern most bay near Garden Avenue. With no rain in the forecast for at least a few days, those operations have resumed. The live garage construction cam is being relocated to give a better view of the work. The feed may go offline soon, but should be functional again by the end of next week. The live feed can be found at https://www.truelook.com/tl/app/?u=tw1469540660#tl_live or by clicking on the link at webster.edu/construction. Concrete pours for the second and third floors is expected to continue through December 2. The installation of ductwork and piping on the first and second floors is scheduled to continue through Dec. 3. Similar work has started on the third and fourth floors and is expected to be completed by Dec. 21. The framing of walls, installing door jambs, and MEP wall rough-in on the second floor will continue through Dec. 15. 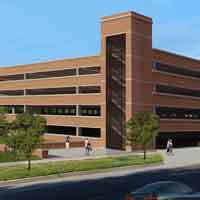 Similar work has started on the third and fourth floors and is expected to be completed by Dec. 23. Another test of the mock-up of the building enclosure systems has been scheduled for Dec. 5.